Pull and clear the Nightmare Buguard from Phominua Aqueducts zone. Move to the third floor. It is possible that the Nightmare Worm may spawn between the ramps leading from the first floor and to the third floor, so this step may need to be skipped and the Nightmare Worm cleared first. Pull and clear the Nightmare Antlion from a random location along the third floor loop. The Nightmare Antlion uses Pit Ambush on aggro, thus it is advised to have a puller with high HP and/or defense. Disband the alliance (parties should not themselves be disbanded) and move to the second floor. Clear the Nightmare Worm. It also appears along the perimeter of the second floor loop, and will automatically draw in the party and alliance (if one exists) of the target. From the north entrance, pull and clear Nightmare Hornets 21 and 24. Pull and clear Vanguard Eye 45 (Hydra Warrior, Red Mage, Ranger). Pull and clear Vanguard Eye 54 (Hydra Dark Knight, Beastmaster, Summoner). This Vanguard Eye will usually link with Vanguard Eye 49's spawns if not pulled first. Pull and clear Vanguard Eye 49 (Hydra Monk, Bard, Samurai, Ninja). The time extension ??? will spawn after Vanguard Eye 49 is defeated. Be aware that new Vanguard Hornets and Vanguard Eyes will spawn once the ??? has been examined. From the south entrance, pull and clear Nightmare Hornets 219 and 222. Pull and clear Vanguard Eye 267 (Kindred Black Mage, Paladin, Summoner). Pull and clear Vanguard Eye 273 (Nightmare Taurus x3). Pull and clear Vanguard Eye 286 (Kindred White Mage, Thief, Beastmaster, Samurai). This Vanguard Eye will usually link with Vanguard Eye 282's spawns if not pulled first. Pull and clear Vanguard Eye 282 (Kindred Red Mage, Dark Knight, Ranger). The time extension ??? will spawn after Vanguard Eye 282 is defeated. Be aware that new Vanguard Hornets and Vanguard Eyes will spawn once the ??? has been examined. Because the ?? ?s appear after defeating Vanguard Eyes and not necessarily their associated spawns, it is possible to make sacrifice pulls of these Vanguard Eyes to avoid having to kill the Hydra/Kindred. This may or may not be appropriate, depending on the overall objective for the run, as it may make some areas unfarmable due to the newly spawned Vanguard Eyes and Nightmare Hornets once the ?? ?s are examined. Leg AF -1 items can be farmed from any accessible group of Nightmare Hornets, which are easily accessible from the tunnel areas. Nightmare Makaras can be reached in the waterways areas through the south entrance on the second floor. Obtain Floor 3 time extension. Clear up to Floor 2 time extension using the south tunnel, but do not examine the ??? until time has almost expired. Farm Nightmare Hornets and Nightmare Makara as time permits. Examine the Floor 2 time extension ??? and clear spawned Nightmare Hornets. Body AF -1 items can be farmed from Nightmare Clusters and Nightmare Leeches. While Nightmare Clusters are generally easier to reach, certain alliance setups may not necessarily be able to deal with the heavy damage caused by Clusters. Nightmare Leeches require more effort/time to reach, but are generally easier to clear. Clear up to Floor 2 time extension using the north tunnel (described above), but do not examine the ??? until time has almost expired. Farm Nightmare Leeches as time permits. Examine the Floor 2 time extension ??? and clear spawned Nightmare Hornets and Vanguard Eyes up to newly spawned Nightmare Leeches. LV74 AF can be farmed from the Hydra spawned by Vanguard Eyes on the second floor. Clear the Nightmare Hornets and Vanguard Eyes from the south tunnel as time permits. Examine the Floor 2 time extension ??? and clear spawned Nightmare Hornets and Vanguard Eyes from both tunnels. LV75 AF and Hydra armor pieces can be farmed from the Kindred and Nightmare Taurus (respectively) spawned by Vanguard Eyes on the third floor. Obtain Floor 2 time extension. Clear up to Floor 3 time extension using the south tunnel (described above), but do not examine the ??? until time has almost expired. For pulls that involve multiple Nightmare Taurus, an Elemental Seal Sleepga (II) rotation may be useful. Clear the Nightmare Hornets and Vanguard Eyes from the north tunnel as time permits. Examine the Floor 3 time extension ??? and clear spawned Nightmare Hornets and Vanguard Eyes from both tunnels. 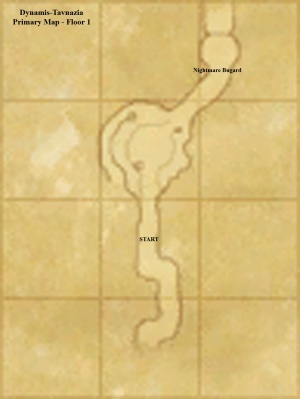 At the start of the run, four Umbral Diabolos NPCs are spawned in the area between the entrance to the Tavnazian Safehold and the intersection of the paths leading from the Misareaux Coast and Lufaise Meadows zones. 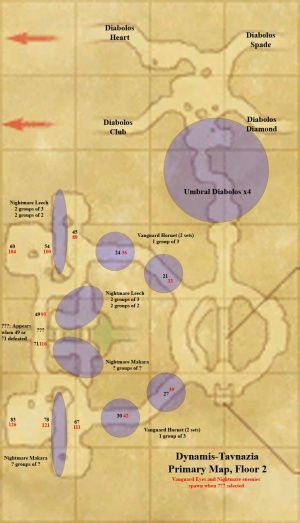 When selected or after detecting a PC (by sight), each Umbral Diabolos will fly to one of the zones and randomly turn into either Diabolos Club, Diabolos Diamond, Diabolos Heart, or Diabolos Spade. Players must try to pass by all four Umbral Diabolos NPCs WITHOUT getting caught by any of them. Although their max HP is lowered if more than one is activated, fighting more than one Diabolos NM can be very difficult and it is thus strongly recommended that as few Umbral Diaboloses as possible be triggered. 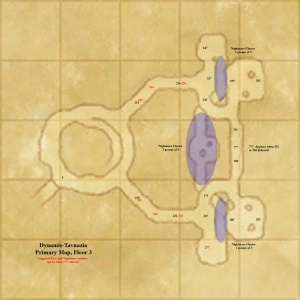 Once all players are in the intersection area beyond the last set of Umbral Diabolos NPCs, pull ONE Umbral Diabolos. This step should obviously be skipped if any of the Umbral Diabolos NPCs have been activated prior to all players reaching camp. If more than one Umbral Diabolos has been activated, it is not adivsed to continue. There does not appear to be any difference between killing one or more Diabolos NMs, although there have been no recorded instances of linkshells defeating all four Diabolos NMs. Defeating Diabolos Club, Diamond, Heart, or Spade (or any combination thereof) does not grant a time extension. Hydra and Kindred in Dynamis-Tavnazia have a probability of dropping LV74 and LV75-specific armor, respectively. Described in Boss Strategy section.